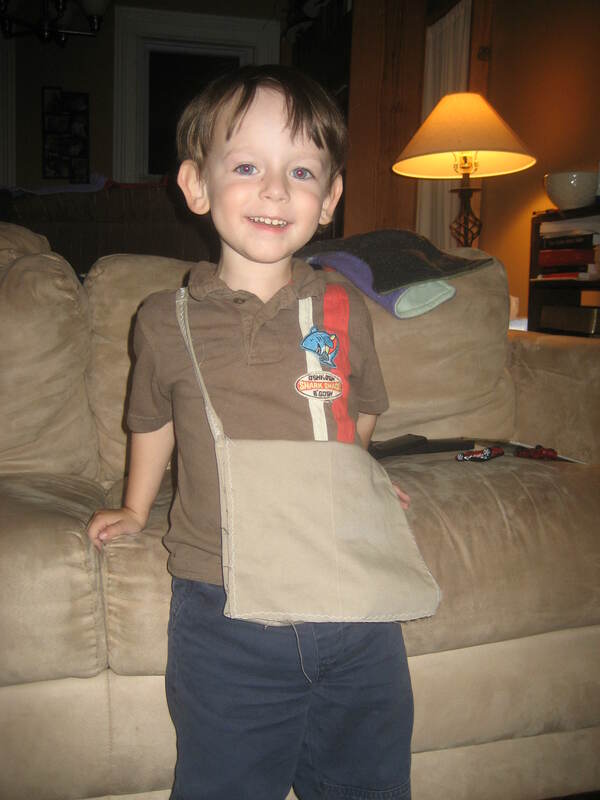 My boy pretending to be Flynn Rider with his new satchel – completed 11/9/11. Here is my little man pretending to be Flynn Rider from the Disney movie Tangled . He wanted his own satchel so we made one up in about a half hour from pant leg of one of his daddy’s old pair of kakhi pants. If old clothes are too ratty and worn to give away and you have the space to save them it’s always fun to come up with new things to turn them into. It’s recycling before there was recycling. I’m sure that Maggie and her girls did that. There are several quilts that were made out of old dresses or baby clothes that are floating around our family closets. Look through your closet and see what you can repurpose. 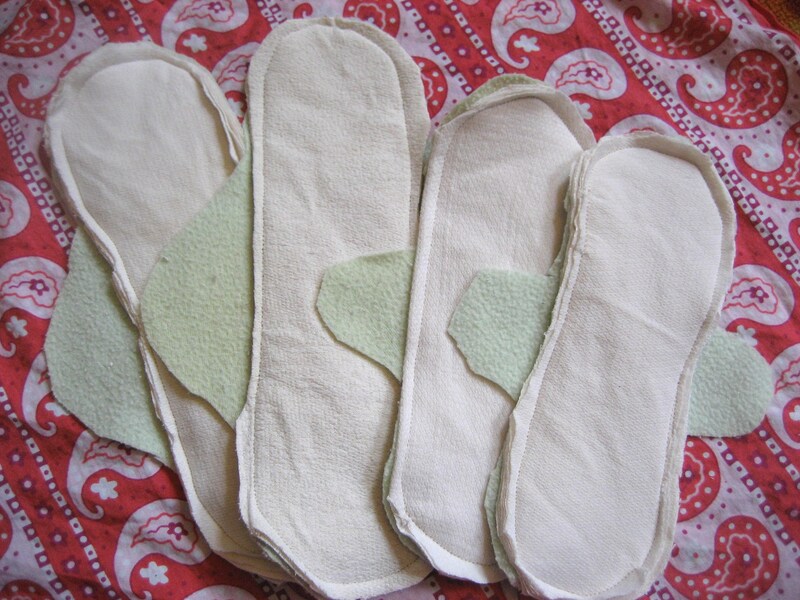 I have often thought of using cloth menstrual pads but never found or figured out a pattern that I liked…. until now. This pattern from The Eco Friendly Family is just what I was looking for. Most patterns that I had seen before used materials that I had to buy. This used things were waiting to be re-purposed into something else. And the pattern was free. What more could you ask? I used old birdseye flat cloth diapers that were being retired for the soaker section and old cloth diaper fleece liners (cut out from cheap Wal-Mart fleece) that I wasn’t using for the liner. 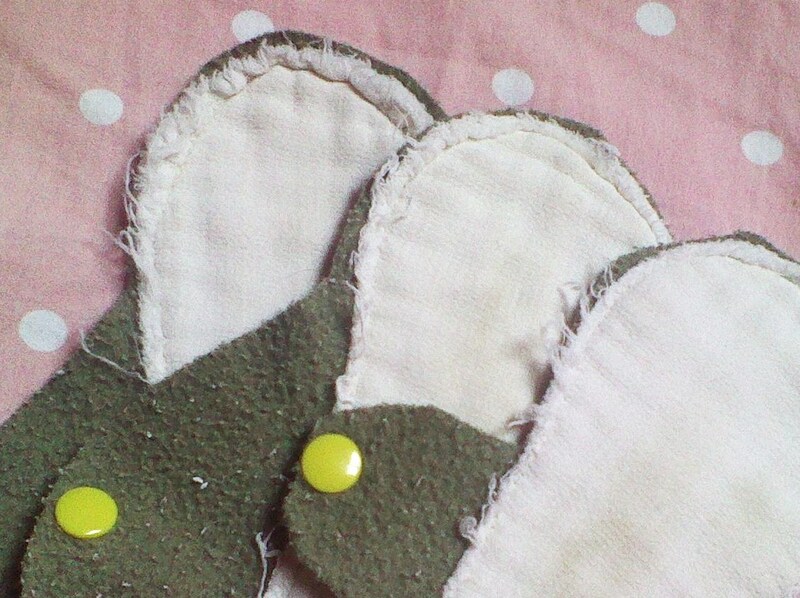 I stiched them up and then, I used leftover KAM snaps from making cloth diapers on the wings and I was done. If you don’t have snap plies you could sew on regular snaps from the craft store, stitch on some velcro or even safety pin the wings. I was in a hurry when I made mine, so I didn’t take the time since to stitch and turn the soaker section so that the seams are inside out like the directions in the pattern instruct you to do. 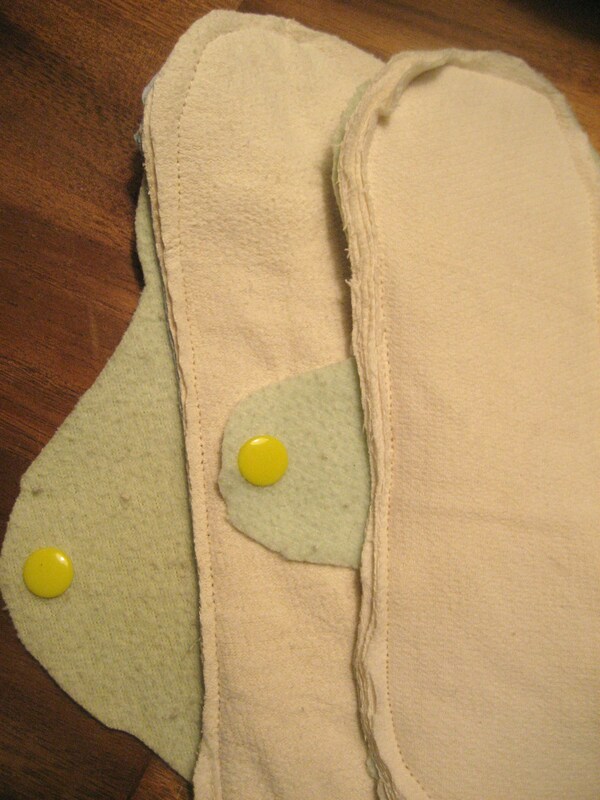 I just folded the flat diaper into either 4, 6 or 8 layers, cut to shape based on the pattern provided and then pinned and sewed it directly on to the fleece liner. So you’ll notice on mine that the edges of the cloth are frayed from washing since I skipped that step. I kind of like it that way especially since it saved me time. I might have taken the trouble to make them prettier if I was making them for someone else. But, I was just making them for me so I figured that they don’t need to be that pretty, especially given their use. These were quick to make and they work very well. 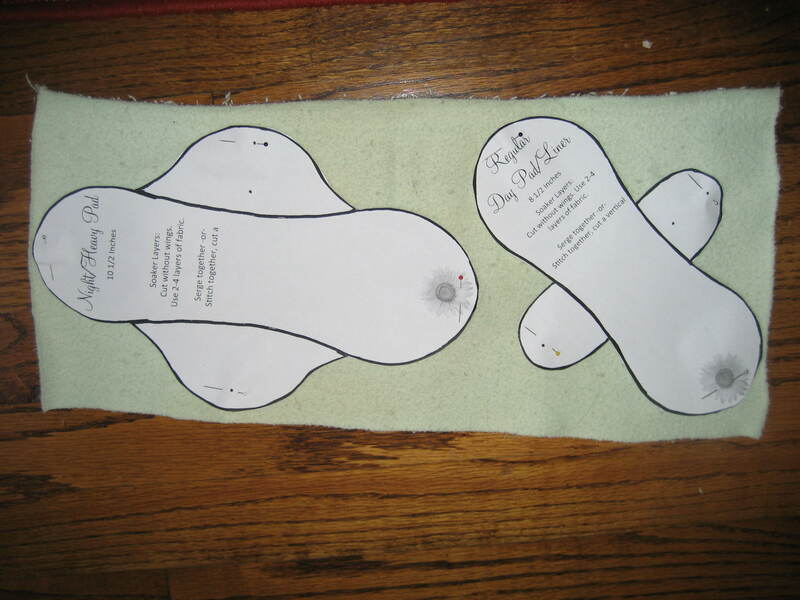 If I remember correctly, there is a free pattern for a small and large pad. 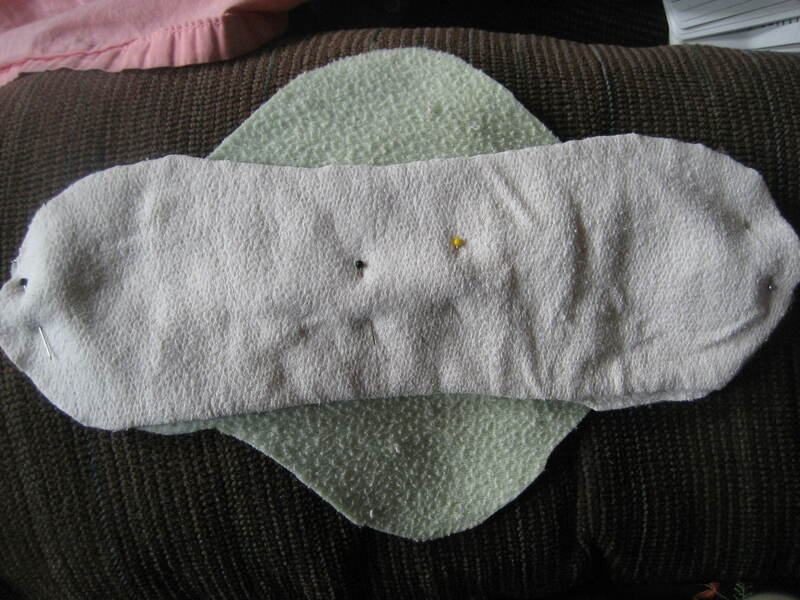 I think you had to pay for the patterns for the postpartum pads.